We are seeing the resurgence of protectionism. In addition, a new tax regime in the United States has reset the playing field, where Canada competes on a daily basis for investment by global firms. The pace of change is accelerating, and innovations are revolutionizing economic sectors. Artificial intelligence, advanced robotics and clean technologies, among others, are redefining the nature of competitiveness. Canada cannot afford to be left behind. The status quo is not good enough. We need to raise our level of ambition—to aspire to "own the podium" on a global scale. Too much is at stake for Canadians' quality of life and Canada's economic success. We need to act now. The good news is that Canada has huge potential, which we can unlock by working together. Agri-Food, Resources of the Future, and Health and Biosciences interconnect with Clean Technology, Digital Industries, and Advanced Manufacturing. Combined, these offer high growth potential. Our aim is to secure a position of strength in the global economy—to leapfrog other countries by taking focused, strategic action. The world needs more Canada. We need to be competitive. We need to push forward with a sense of purpose to achieve growth targets. That means establishing a competitive system that is attractive to private investors. It includes activating the potential of our entire domestic workforce and attracting talent from other countries to round out our capacity. It means investing in digital and physical infrastructure, branding Canada as a country dedicated to innovation and driven to do business better, and making our regulations more modern and agile. It demands that all sectors ramp up their adoption of new technologies, and that government and industry work together to scale-up our most promising companies so they can anchor the country's future economic growth. Since fall 2017, we have met monthly: reviewing economic analysis, speaking to experts, and reflecting on our practical experience building and growing companies. We've identified growth opportunities, pinpointed challenges and shared insights across sectors through a recurring All-Chairs Forum. Most importantly, we made a commitment to this process as Canadians. That work has led us to a comprehensive set of proposals to boost competitiveness for the economy as a whole and for each of our sectors individually. Those proposals are captured in this report, setting ambitious targets and concrete steps for reaching them. If adopted, they have the potential to raise Canada's gross domestic product (GDP) by up to $318 billion (a 15% increase above national GDP in 2017) and increase the median Canadian household income by approximately $13,000. We know success won't happen overnight. But it will happen—if we act together now. No single company, industry or level of government can implement our recommendations alone. What we propose demands collaboration, trust-building, and the collective strengthening of our country's innovation and competitiveness ecosystem. If we do it well, we will ensure Canadians' quality of life well into the 21st century. We're proud to have been part of this vitally important exercise. And we're eager to continue our work—through these Tables and within our industries—to seize this opportunity for Canada's future. "This is the moment to make moves. Not just Canada's moment: a global moment. But in how we respond, we can define our share of what the future will bring." The goal of Canada's Economic Strategy Tables is to create the conditions for strong, sustained, long-term economic growth that will secure Canadians' quality of life. We live in a country with just 0.5% of the world's population but 10 times that share of the global economy. The difference between the two is the key to our quality of life. Like other G7 countries, however, our annual GDP growth has slowed, and this downward trend seems to be accelerating. An older population will shrink the country's tax base, increase the number of people dependent on the country's workers, and pressure our cherished pension and healthcare systems. Nearly half of work activities in the country could be transformed by automation, a trend that is likely to affect those with lower incomes more than those with higher ones. To protect the services we consider foundational and ensure opportunities for all Canadians, we need to give our economy a jolt by increasing our competitiveness. This will increase the number of firms that grow in Canada, anchoring rich clusters that create good jobs and contribute to the tax base that supports our quality of life and our social programs. The good news is we have many strengths to leverage: great innovators, a stable banking system and good corporate governance. As a country, we have a diverse population and a commitment to social and environmental sustainability. We have an opportunity to be the disruptor, not the disrupted. What we need now are competitive firms that can grow at a global pace—and help grow the Canadian economy—supported by a partnership between industry and government to implement critical actions, prioritizing what matters most. "We wanted to be part of this Table because Canada has growth potential—but right now we are just not competitive. I believe in the opportunity we have to change this." "Being a Canadian global company with strong domestic roots, I believe we're at a crossroads in terms of our success. Can we compete globally? We're at a critical point in time in terms of opportunities." ...identifying a few sectors where Canada has a strong endowment, untapped potential, and significant global growth prospects. We then recommend Canada take a focused approach that removes barriers and galvanizes the sector around a bold growth agenda. Peer jurisdictions like the U.S., the U.K., New Zealand, and Australia have begun to move toward this approach, and Canada should do the same. Since then, we have worked to establish a vision—setting the course with ambitious growth targets for 2025, determining barriers to overcome, and proposing business-led solutions, government policies and public-private partnerships that are bold yet doable. Our interim reports explain the strategic opportunities we identified for growing the Canadian economy by leveraging the growth promise of our six sectors. As part of that work, we have also identified a set of cross-cutting strategic imperatives: defining factors that we must accomplish to achieve our growth targets. All economic sectors must be digital sectors. Digitalization is a tactic that can differentiate Canada, and bold adoption of digital platform technologies will enable us to leapfrog other countries. Investing in digital infrastructure is as vital as investing in physical infrastructure—and it has to be inclusive. Every Canadian, regardless of geography or demographics, needs to participate in the digital economy. Regulatory agility is critically important. This is true not only for the regulations themselves but also the approach to regulation. We urgently need to establish a modern regulatory system that fosters innovation and adoption by focusing on outcomes, not prescriptions. This will require a new, collaborative relationship between industry and regulators, and has to move away from a system that requires multiple, overlapping reporting requirements for the same issue. Not only does this have no value in terms of protecting Canadians but it also drives companies away from Canada. The Canadian way to regulate should involve world-class regulations that protect Canadians and the environment while leveraging regulation as a competitive advantage. Skills are the new currency. Canada needs to cultivate a future-fit workforce by adapting educational programs to be digitally focused and workplace-ready, increasing work-integrated and career-long learning. Apprenticeship and skilled trades need to be part of Canada's approach, and we need to up our game in the global war to attract and retain more talent—including C-suite leadership. Inclusiveness, diversity and parity require commitment. Our six sectors need to be more inclusive of all Canadians. Change needs to speed up and industry leaders have a role to play in making that happen by shifting corporate cultures and changing mindsets. This also requires the participation of educators, as school years from kindergarten to grade 12 are an important period for generating career interests. Gender parity is an economic essential. By fully including women, Canada could add $150 billion in incremental GDP by 2026 or see a 0.6 % annual GDP growth. "Are we going to own our destiny or be part of someone else's master plan?" Indigenous peoples are an important part of Canada's story, from its origins to its future potential, and represent Canada's youngest and fastest-growing demographic. Prominent Indigenous business leaders served as members on our tables to help tackle Canada's growth challenge. In our reports, we have highlighted steps that could propel Canada forward and enable stronger partnerships with Indigenous peoples— particularly in the areas of digital and physical infrastructure, and by promoting diversity and inclusion in the workforce. All levels of government need to operate at the speed of business and with better coordination. Having to navigate multiple programs, deal with multiple levels of government and sift through multiple information channels all create transactional costs for companies and reduce uptake of programming. There is strong support for greater collaboration to align policies, standards and regulations—and also to integrate programs that support workforce skills development. Model initiatives like the Clean Growth Hub reduce costs for firms to access federal programs by taking a whole-of-government approach. Government procurement can be used to accelerate adoption of Canadian innovation, drive solutions to big challenges and send powerful signals in the marketplace.Cost should not be the only objective: value-based procurement can drive improvements and accelerate Canadian-made solutions, especially in sectors like health care. Government procurement can also enable supply chains to be more inclusive, involving Indigenous and women-run businesses, and can drive the incorporation of clean and digital technologies into infrastructure projects. The cluster model has potential to increase innovation uptake and strengthen individual firms.We endorse Canada's approach to superclusters, which is key to helping the country double down on scaling up—growing firms into large anchor companies that stay in Canada. Clustering creates network effects that include sharing best practices, peer "nudging,"and establishing demand for goods and services that are more technologically sophisticated. Efforts must be balanced between championing Canadian firms and attracting foreign direct investment(FDI). The importance of Canada as a global investment destination cannot be overstated. But part of the consideration around potential FDI has to be how it will support the domestic ecosystem. Many Table members whose companies have scaled-up have stories about seeing a foreign competitor celebrated in Canada when their own firm was not. We propose six Signature Initiatives to jolt our global competitiveness and attract investment. If implemented, their total "economic potential" could be up to $318 billion in additional GDP growth by 2030, an increase of 15% above 2017 levels. This could translate to an increase of approximately $13,000 in the median Canadian household income.Footnote 1 We reached this figure by establishing the "economic potential" of each Signature Initiative to accelerate the six economic sectors and also factoring in their ability to create positive multiplier effects for the wider economy. But we believe the greatest outcome of these initiatives is the resilience of the competitive ecosystem. We have identified a performance aspiration for each to communicate our ambition and track success. Each of these metrics contain globally recognized indicators. Canada has a healthy start-up and small and medium enterprise (SME) ecosystem with more than 1.1 million SMEs accountingfor more than half of Canada's GDP. Canada's lack of anchor firms has an impact on its competitiveness. In 1990, we had 18 global industry leaders. In 2015, we had just 5. According to the World Bank Doing Business 2018 report, Canada ranks second out of 190 countries in ease of establishing a new firm, taking less than two days to launch a business. Only 2% of Canadian mid-sized businesses grow to become large companies each year. Canada needs to adopt a new approach: building business winners. Taking inspiration from the Own the Podium initiative that led the country to its highest-ever medal count at the 2010 Winter Olympics in Vancouver, Canada has to drive performance by supporting its highest-potential and highest-performing industry players to go for the gold in a competitive global environment, growing global leaders and anchor firms. Large anchor firms are an important component of economic clusters. We're calling for focused support in key areas to scale up Canada's highest-potential companies in each of our six sectors. Canadian entrepreneurs are good at launching companies but struggle to scale, citing insufficient access to financing, advice, global talent, markets and growth opportunities as barriers. We need more high-growth firms to secure our future and drive job creation, innovation and growth. We can no longer sprinkle fairy dust and hope our entrepreneurs will succeed. In the high-tech industry specifically, many promising, innovative Canadian companies with the potential to become major players or even anchor firms are acquired at an early stage in their evolution. In the pharmaceutical industry, companies have been trending toward a reduced Canadian footprint for headquarters, R&D spending and manufacturing, with acquisition forming a typical success path for many. We have to act now to ensure more Canadian firms have the opportunity to scale up and anchor clusters, build strong supply chains founded on Canadian innovation and ultimately become acquirers of companies themselves. "We have to take some of these Canadian developing stars and help them scale up and grow if we want to own the podium. We need to celebrate and support our stars in our own backyard, adopt some of the new technologies and work to get Canada a larger role on the global stage." "The spray-and-pray strategy has its limits. In business, like in sports, it is much more efficient to build winners that have the potential to own the podium." Participation in the Own the Podium initiative would give firms a "best in class" accreditation that would be recognizable to potential investors, global talent, partners and customers. Success depends on significant private-sector leadership, investment and involvement—in addition to a culture change in government. Own the Podium must operate at the speed of business, with an agile selection process, highly responsive service delivery, and openness to iteration. There is a triangular graphic. 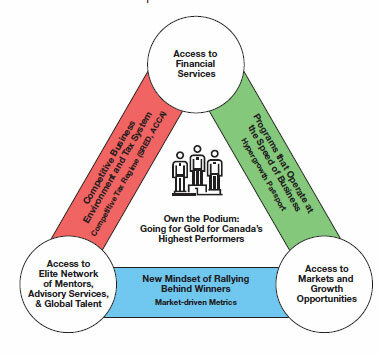 In the centre is some text that says "Own the Podium: Going for Gold for Canada’s Highest Performers," which is accompanied by an icon. The right side of the triangle contains a green bar that is labeled "Programs that Operate at the Speed of Business. Hypergrowth Passport." The left side of the triangle contains a red bar that is labeled "Competitive Business Environment Tax System. Competitive Tax Regime (SRED, ACCA)." The bottom part of the triangle contains a blue bar that is labeled "New Mindset of Rallying Behind Winners. Market-driven Metrics." At the highest vertex of the triangle there is a white circle that is labeled, "Access to Financial Services." At the bottom right vertex of the triangle there is a white circle that is labeled, "Access to Markets and Growth Opportunities." At the bottom left vertex of the triangle there is a white circle labeled, "Access to Elite Network of Mentors, Advisory Services, & Global Talent." Own the Podium firms should also have access to the Accelerated Growth Service, which provides high-growth firms with a tailored and coordinated, whole-of-government approach to service delivery. This new approach would provide increased recognition, promotion and visibility to Canada's most innovative firms as we celebrate our highest performers. For Canada's highest-potential firms to truly Own the Podium, a competitive tax framework and underlying policy conditions to scale-up are needed. The targeted and tailored support offered through Own the Podium can only be effective if Canada takes action to create a business environment that attracts investment and is primed for growth. The six signature initiatives we have put forward will work in concert to improve Canada's competitiveness and communicate to the rest of the world that Canada is open for business. "Regulations are priority number one, two, three and four. If we don't fix our regulatory issues, none of the rest matters." Canada's world-class, rigorous regulatory system gives Canadians and our country's trading partners confidence that products made in Canada meet the highest health, safety, environmental and quality requirements. Canada's regulatory system is also complex and inefficient with no defined outcomes and timelines, layered with a multi-jurisdictional structure with no clear authority. Often, multiple regulations exist to address the same issue but in slightly different ways. This creates inconsistencies and administrative burdens, resulting in an inefficient system. Canada's complex regulatory system is one of the top reasons foreign investors are no longer investing in Canadian projects and has been identified as the number-one barrier to competitiveness by almost all Tables. Canada's regulatory system is also not conducive to innovation. Many regulations are either outdated or too prescriptive of the process rather than the outcome, which deters the deployment of innovative solutions that can further improve health, safety and environmental outcomes. Inefficiency adds cost, limits innovation, detracts investment and slows down projects—eroding trust between industry and regulators, between provincial and federal regulators, and even among regulators interprovincially. As just one example of the negative impact of these conditions, Canada ranks 34th out of 35 Organisation for Economic Co-operation and Development (OECD) countries in the average time to receive project construction approval. The pace of the current regulatory system is not designed to keep up with the rapidly changing global environment. This needs to change. Canada has 11 overlapping federal and provincial regulations for the same air emissions. This does not improve environmental performance any more than a single, effective regulation would, but adds confusion, complexity and cost to industry. We're calling for Canada to establish an agile, modernized regulatory system that ranks within the top quartile globally, is conducive to innovation, creates public trust and attracts investment. We can achieve this by implementing an outcomes-based approach that is predictable and transparent, stimulating innovation and achieving investment certainty with a built-in, continuous review process to ensure relevance and eliminate duplication. Underpinning this is a fundamental change in relationship between industry and regulators supported by ongoing dialogue and the use of pilot programs and sandboxes for experimentation. An agile regulatory process will support Canada's desired environmental, health, safety and economic outcomes. Australia's Industry Growth Centres Initiative is tasked with identifying regulations that are ineffective, unnecessary or overly burdensome and provides suggestions for reforms. Best-in-class institutions for granting construction permits have allowed Australia to speed up processes and reduce costs while maintaining high standards. The U.K.'s Red Tape Reduction initiative has successfully eliminated redundant and outdated regulations, and consolidated legislation for efficiency. Japan is building domestic champions by ensuring investors benefit quickly from regenerative medicine breakthroughs thanks to a fast-track approval process. Norway fast-tracks projects for regulatory approval when certain criteria are met such as environmental performance and community enhancement, and when the project proponent has a proven safety record. The Best Practice Regulation provides "common language" for discussing the performance of regulatory regimes and keeps regulation fit for purpose through mandated ongoing review of existing regulations. The Rules Reduction Taskforce was created to streamline regulations. To address the importance of both federal and provincial regulations, this charter should be signed by representatives of both levels of government. As well, to withstand political pendulum shifts, we recommend the charter be legislated. This council would comprise industry and subject-matter experts at both federal and provincial levels for each of the key economic sectors. By recommending new approaches that stimulate innovation and drive sector growth and competitiveness, the council can reduce negative cumulative impact and maintain world-class standards. The council would report to First Ministers on a regular basis with a commitment to be discussed at upcoming First Ministers' meetings. A convener body should be created to act as the secretariat for the council's work. The convener's key function would be to strike time-limited working groups to facilitate sandboxes and pilots to drive technology commercialization, or test regulatory changes at a small scale to assess effectiveness and unintended consequences. Technology Adoption Centres can also be used. Recommended solutions will be brought back to the council. Several Tables expressed frustration with the slow pace of removing barriers to domestic trade. Breaking down Canada's own internal trade barriers is a goal that needs to be accelerated under the Canadian Free Trade Agreement for the sector tables to reach their growth targets. We call on the Honourable Dominic LeBlanc, Minister of Intergovernmental and Northern Affairs and Internal Trade, and provincial ministers to set an ambitious timeline. "For my firm, recruitment of people with strategic knowledge, especially engineers and skilled trades, is the key factor limiting our growth. And working with universities is not fast enough. We need to recruit from other countries, and recruit from other industries, and transform those with other skillsets. We also face issues with access to capital, but we have figured out how to solve those. We have not yet figured out how to address access to talent." 83% of educational providers believe graduates are prepared for the job market. Just 34% of employers agree. Fewer than 10% of Canadian employers collaborate regularly with education providers and may not be involved in conversations around curriculum design or skills development. The Growth Council concluded the annual cost of adult reskilling needs to increase by ~$15 billion to manage the effects of automation. Talent is the most powerful resource for driving competitiveness and enabling inclusive growth. In order for companies to be able to scale, compete and innovate, they require people with the right technical, business and entrepreneurial skills combined with real-world, relevant experience. Canada is a highly innovative country with a strong research base and thriving communities of technology start-ups. However, we don't have enough people with the types of skills and experience needed to scale up businesses. Even when companies have skilled workers, there is a need to invest continuously in reskilling these workers to keep pace with constant technological change. It takes a culture of lifelong learning to be resilient enough to weather the winds of change. It starts with children. At a young age, children begin to make choices about what they want to study, and these choices can either set them on a certain career path or close doors. All Tables indicated that the kindergarten to Grade 12 education system needs to evolve in order to increase awareness of the opportunities available in a range of fields and careers. Curricula need to be adapted to help students develop not only the fundamental skills and knowledge traditionally taught but also more computational, trades-oriented and entrepreneurial skills. We need to ensure that all Canadians, wherever they live, have access to the same educational opportunities throughout K-12. We also need to include everyone in the workforce: we can't afford not to have women and men, people with disabilities, Indigenous people and new Canadians in our pool of talent. Many Canadian firms have indicated that, with the right talent, they would be able to double their current size. As part of their quest, they are also looking globally to recruit the key high-skilled people who can catalyze their firm growth and create jobs for Canadians. But we are not alone: there is global competition for talent. INSEAD (originally known as the Institut Européen d'Administration des Affaires), one of the top-ranked business schools globally, studies countries and ranks them annually on a Global Talent Competitiveness Index. In the 2018 edition, it ranked Canada 10th in the world for its ability to attract talent and 18th in retaining talent. Canada placed 15th overall. We need to improve on this front. These skill hubs will drive the development of industry-led talent roadmaps that enable each sector to reach its growth targets based on timely labour market information. The makeup of the hubs will vary, but all will involve industry leaders, federal and provincial/territorial governments, educational institutions (primary, secondary and post-secondary), labour unions and Indigenous organizations. Strong coordination among the six hubs and links to current initiatives will be essential. Curricula should be designed so students from K-12 have more opportunities to participate in computational and STEM-related learning, and to engage at an early age with technical and entrepreneurial role models. Together with stronger branding of the sectors, this will help attract new people to the six priority sectors including youth, women, Indigenous workers and other underrepresented segments of the workforce. The skill hubs can support the expansion of access to work-integrated learning opportunities by coordinating the development and promotion of spaces within their industry sector. We need to create reskilling opportunities for mid-career workers so they can keep pace with the speed of technology. As part of this, we should have portable, pan-Canadian, competency-based credentials so Canadians have flexibility to work where they want and employers have confidence in the knowledge of their workforce. The Tables also propose a digital education platform to support this learning so that Canadians can access online courses wherever they may be. The skill and talent collaboration hubs, in cooperation with the Future Skills Centre , would undertake a best practice approach to apprenticeships (based, for example, on the German model). This could then be leveraged over the longer term for skilled trades more broadly. In the immediate term, it is important to communicate to K-12 students and their parents the fulfilling opportunities that a career in the skilled trades can offer. Skilled trades in some sectors, like agri-food, are indispensable to meeting growth targets. We also need to proactively engage underrepresented groups including women, people living with disabilities and Indigenous people to share career pathways and support mentorship program/role modelling campaigns. Labour market information needs to be made available to companies in real time, increasing opportunities for work-integrated learning, and piloting mid-career reskilling and upskilling initiatives. This should include access to data on diversity and inclusiveness so progress can be measured. A global talent attraction hub would actively run "talent missions" like the "trade missions" Global Affairs Canada currently develops. This hub will need to be supported by a branding strategy and a single-window platform to highlight Canada's advantages—building on models like Invest in Canada and EduCanada, and communications vehicles like Go North Canada. This would help focus employer efforts to attract, process and approve foreign workers with in-demand skills. We need targeted incentives to retain the global talent that comes to study in Canada. This should include increasing the availability of work-integrated learning opportunities for foreign students in in-demand fields, as there is evidence that this early work experience boosts the likelihood of future employment in that field. Sector-specific global scholarships, with government and industry co-investment, could also help develop and retain talent by encouraging high-potential students to commit to work in the sector that sponsored them when they finish school. We support the Global Skills Strategy and recommend continuing the Global Talent Stream. These are "game changers" to speed up bringing in specialized foreign talent when Canadian workers aren't readily available. These programs help firms grow in Canada and have carry-forward benefits for creating Canadian jobs. Canada should communicate the elements and benefits of these programs more widely. The Temporary Foreign Worker Program and immigration programming need to support immediate labour shortages so high-growth sectors can access global labour force across all skill levels. All Tables were overwhelmed by the multitude of government programs and initiatives, and, in many cases, firms were not aware of existing programming. Federal skills and talent programs should be consolidated and streamlined to improve access and use. Federal and provincial programming also need better coherence and alignment. Steps should also be taken to clarify current programming, which can be difficult to understand and navigate for businesses. Given the pace of change, we are calling for a national pilot program aimed at life-long learning. The initiative would provide applicants with a fixed amount of funds to be used for training. Applicants could choose where to be trained, with the possibility of additional matching funds from the industry. "We need a meeting place for decision makers. A place to showcase technologies to purchasers and pilot integration into existing processes—to test how new ideas and technologies are useful for a sector." 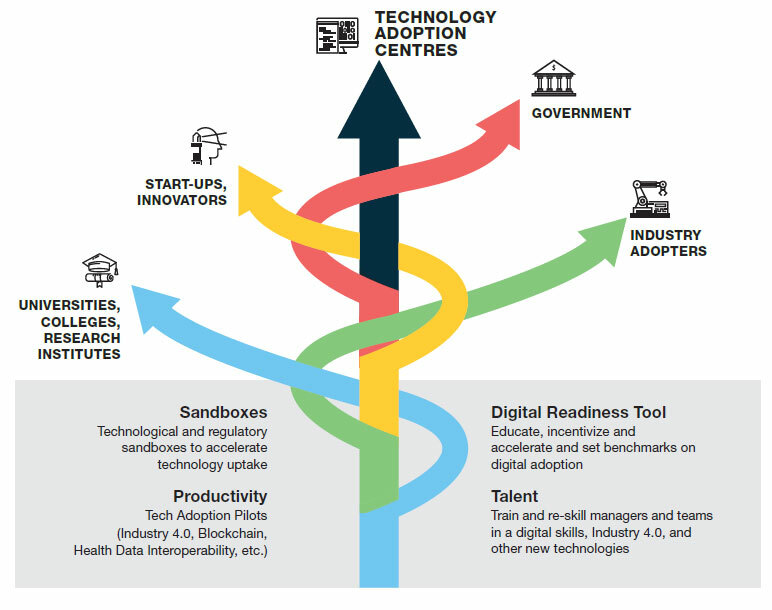 To drive technology adoption and leapfrog our global competition, Canada needs Technology Adoption Centres that connect innovators and adopters and de-risk key sectoral challenges. They should draw inspiration and adopt best practices from around the globe (including Fraunhofer Institutes, Australian Growth Centres, U.K.'s Catapult, France's Carnot Institutes). Canada is establishing a global reputation for idea generation and is known as a hotspot for high-potential start-ups. But our commercialization performance is weak: purchasers favour established solutions, even if the potential rewards for doing something new are high. This still happens despite Canadian global leadership in areas like artificial intelligence, augmented reality and collaborative robotics—which we could build on to drive our competitive advantage. Each Table discussed Canadian companies' hesitation to invest in technology—from uncertainty about how an innovation can improve their business and worries about how much it will cost to lack of demand for new products resulting from innovation. According to an OECD comparison, Canada ranks 16th over 32 countries on ICT investment by capital asset as a percentage of GDP.Footnote 2 Bottom line: if we lag behind our global competitors, we will lose market share. On the other side of the story, Canada is a relatively small market for technology developers, with limited opportunities to prove new products in the marketplace and scale businesses domestically before they start exporting. As a result, Canada's export growth has slowed over the past 15 years. Our small and medium enterprises (SMEs) account for 50% of jobs, but only 30% of exports due to the lack of a Canadian globally competitive ecosystem. We need to help companies understand how available technologies can bring advantages to their businesses, generate domestic demand that will help Canadian innovators grow and position our country as a global centre of excellence in our areas of relative strength. Inspired by best practices from around the globe, the distinctly Canadian Technology Adoption Centres can showcase technology adoption opportunities and support companies' development of digital-first managerial skills and cultures. Sector to sector, these centres could do everything from piloting value-based procurement, hosting electronic health record pilots, furthering Industry 4.0 and providing a national basis for agri-food innovation, clean technologies, new products, and more cost- and environmentally effective resources. Wherever possible, this would be done by leveraging existing capacity. These centres would promote Canada-first digital solutions. They would offer regulatory and technological sandboxes for accelerating technology uptake and improving coordination across sectors, and host a digital assessment and adoption tool. They would help close the gap between existing research facilities and industry, focus government funding and contract research, and provide a venue for networking across industries and between governments—sharing best practices and speeding up technology diffusion. To build connections among the Canadian innovation and technology players, the centres could be run by existing not-for-profits, or new ones that bring together all players of the ecosystem. Knowing how to evaluate potential new technologies, and bring them into company operations, is a key issue for many entrepreneurs. Creating an assessment and adoption tool could allow Canadian businesses to leapfrog their global peers, with a focus on AI and advanced analytics in particular. It could also help us achieve greener outcomes. The centres could be combined with funding support to implement the assessment, drawing lessons from past programs like the National Research Council's Digital Technology Adoption Pilot Program. The centres could also develop digital skills and culture among executives by exposing them to the "art of the possible," offering coaching on how to lead digital transformations and providing practical support with adoption. Canada has a two-part opportunity: first, to address our tax competitiveness as a response to recent tax policy changes in the United States; second, to do so in a way that aligns with our recommendations on high-growth firms and reinforces Canada's areas of strength. With the recent Tax Cuts and Jobs Act, the United States allows a 100% depreciation deduction in the first year for investments in equipment, until 2023. We are recommending that Canada match this, so that Canadian early adopters can lower their business costs and boost adoption of innovative technologies. Several Tables made specific recommendations regarding accelerated capital cost allowance. The current Scientific Research and Experimental Development (SR&ED) program, a tax incentive that encourages Canadian businesses to conduct research and development in Canada, should be redesigned to help companies scale up. Under the current program, Canadian SMEs receive a refund of up to 35% of the first $3 million in eligible expenditures annually, but larger companies receive significantly less. The government should refocus to support more high-performing scale-ups to increase our chances of building billion-dollar anchor firms. Low-performing firms must be allowed to fail in order to free up tax dollars. All Tables agree that the research eligibility criteria are out of step with the kind of research that characterizes today's digital era. As such, there needs to be a review of the eligibility criteria. Also, in an open economy where growth capital often comes from outside Canada, the current Canadian ownership criteria is a missed opportunity to support our highest growth companies, who may be sourcing some of their capital from global pools. There is a graphic with one straight black arrow pointing upwards at the title "Technology Adoption Centres," which is accompanied by an icon. There are four coloured arrows intertwined around the black arrow. The red arrow points in the upper-right direction to "Government," which is accompanied by an icon. The green arrow points in the bottom-right direction to "Industry Adopters," which is accompanied by an icon. The yellow arrow points in the upper-left direction to "Start-Ups, Innovators," which is accompanied by an icon. The blue arrow points in the bottom-left direction to the title "Universities, Colleges, Research Institutes," which is accompanied by an icon. "Canada's size is a blessing but can put us at a disadvantage compared to smaller countries when it comes to digital connectivity. Are we going to accept the limitations of our geography, or adapt and overcome?" Canada's economic competitiveness depends on a national infrastructure network that gets goods to market quickly, integrates physical and digital technology, and connects us all. While these investments represent significant financial costs, infrastructure is the foundation to achieving our growth targets. To make sure investments are well-deployed and optimized, we need a strategic approach with a rolling, long-term national infrastructure plan that maps projects against market opportunities and emerging technologies. Using Cisco two-way video conferencing technology, Connected North works to foster engagement and enhanced education outcomes in remote Indigenous communities. This digital platform allows schools to connect with experts, virtual field trip sites, other classrooms, mentors and role models, mental health programming and teacher training. In Nunavut, 81% of students felt they learned more in the virtual sessions than they did through traditional classroom learning. An ambitious partnership of 22 First Nations communities, this program connects remote communities currently powered by diesel to the provincial electricity grid. Diesel energy is costly; poses environmental, health and safety risks; and is unreliable. As owners of the project, Indigenous communities are connecting nations and strengthening local economies. From the time of Confederation, when a transcontinental railroad symbolized our "National Dream", we have recognized that infrastructure is what knits our country together. Today, a connected digital infrastructure is our nation-building imperative. Each of our Economic Strategy Tables has talked about the potential this would unlock for their sector: Entrepreneurs will be able to grow businesses outside of large centres. Farmers will be able to use precision agriculture to reduce waste and increase yields for their crops. Consumers will have increased confidence because their food has been tracked the whole length of its journey, from farm to plate—and because this journey has been shortened by streamlined freight logistics. Resource firms will be able to automate their processes in remote areas, decreasing environmental impact and increasing safety for workers. Blockchained low carbon molecules will become the standard, and Canada will be the global leader. Shovel-ready sites, preapproved for development to support investment attraction, will be the norm. Pipelines will transport our resources. Patients will have digital personal health records, and their information will travel with them wherever they live or seek care. Workers from Indigenous and northern communities will not have to leave their homes to train and be employed in a digital economy. We recognize that this connection comes with a high cost, and that some of the technology that would make it possible has not yet been invented. We also feel there is a huge global opportunity for Canada: if our innovators are challenged to solve this problem, their solutions will be in demand in other countries facing issues of distance and geography. Demand for transportation capacity is on the rise in Canada. But the 2016 Canadian Infrastructure Report Card found 10% to 20% of the country's physical infrastructure assets are in poor or very poor condition. This is a key barrier to export growth. Infrastructure is also critical for both mitigating climate change (e.g., electric vehicle charging stations, high-speed rail, energy-efficient buildings) as well as adapting to climate change (e.g., porous pavement to mitigate flooding, more stringent building codes to withstand extreme weather). These infrastructure investments can stimulate clean technology adoption and accelerate Canadian competitiveness. The World Economic Forum's Global Competitiveness Report recognizes infrastructure as a key pillar that contributes to a nation's competitiveness. Canada's infrastructure was ranked 16th out of 137 countries in 2017–18. With the creation of mechanisms like the Infrastructure Bank, we are on a good track to improve this ranking further—but we must make sure that when we make investments, we are reaping a return that meets our growth targets. This means prioritizing infrastructure that opens access to new export markets or increases growth at home, such as pipelines. These essential investments will enhance our transportation systems and help Canada achieve a top-10 ranking on the World Bank's Logistics Performance Index by 2025. Infrastructure leaders like the Netherlands, Australia, Germany, the U.K. and the U.S. have shown the value of collaborative, comprehensive strategic planning of these investments. With the right digital and physical infrastructure investments, the opportunities that Canada will gain in a data-driven economy cannot be overstated. By 2025, we need to establish a digital infrastructure system that will provide 100% universal, affordable, next-generation Internet access to all Canadians and allow us to reach global benchmarks for fast, low-latency, unmetered wired and wireless connectivity. This is a core foundational investment. The European Union's General Data Protection Regulation (GDPR) came into force during the period when our Tables were meeting. This brought into sharp focus the need for Canada to respond by updating our privacy frameworks to a digital era and by harmonizing them to a single standard, as the European Union has done. Because our high-growth firms are also exporters, many of us have already invested in systems to meet the very high standards for personal privacy set out by the GDPR. We need to establish data libraries that pool large quantities of anonymized data so innovators can draw on them to develop machine learning or other data analytics solutions. This is important across all our sectors—as much for remote-operated drilling as for algorithms that water greenhouses. Government has a role in setting the security and privacy frameworks for these libraries and assuring compliance. Digitalizing government services is also a huge opportunity to create data pools that would increase program effectiveness. But most of all, we expect the Government of Canada to take a leadership role in end-to-end digital service. At the very least, every government service needs to be delivered online to eliminate the need for in-person visits and the printing, scanning and mailing of government documents. A rolling plan would provide a strategic approach to infrastructure planning, including prioritization of projects to address critical bottlenecks to meet our growth targets. The plan should be developed by a committee of industry and government reporting to federal, provincial and territorial ministers of transport and infrastructure. The Agri-Food and Resources of the Future Tables have also identified specific high-impact projects for early consideration. As we address these infrastructure projects, we have an opportunity to use procurement processes to achieve multiple goals. For example, in the resource sector, firms have developed partnerships with Indigenous businesses that improve local economic activity by formalizing supply chain management processes and by building skills they can later use to apply for other contracts. We also endorse the use of "technology challenges" (such as Innovative Solutions Canada and the Strategic Innovation Fund) that use procurement relationships to accelerate innovation. We call on larger firms to use this model to accelerate innovation within their supply chains—for instance, to push the adoption of advanced manufacturing or of clean technologies. This both encourages and supports firms to invest in the future. To support the adoption of health innovations for Canadians, our Health and Biosciences Table has spelled out, in detail, how a value-based procurement approach could transform Canadians' access to health innovations. "Let's contribute to a success in which everyone can participate." In the global economy, countries have brands: identities buyers relate to, respect and seek to do business with. Canada has a strong international reputation based on our values and identity, but our country's brand needs a refresh—to be updated to tell the world what our innovative economy has to offer. A strong brand can impact virtually every aspect of a country's economy and support investment and talent attraction objectives as well as export targets. Whether the brand is tied to people, companies or places, it is intended to capture premiums. The correlation between a strong national brand and economic premiums cannot be understated. A strong brand ensures competitive advantages in everything from tourism and business investment to the sale of goods and services, ultimately enhancing a country's stature on the world stage. Canada's global brand strength has increased over the years, but so have other countries' brands—to a greater degree. The Brand Finance report on the top 20 most valuable nation brands ranked Canada seventh in 2017, up one spot from 2016 but nevertheless well behind the United States, China and Germany. It is important that Canada learn from other nations like Germany, whose manufacturing labour costs remain among the highest in the world but have been able to remain competitive by relentlessly focusing on high quality, innovation and specialized niche production. Canada has a powerful brand; let's use it. We perform well on trust, building upon a reputation for quality that is synonymous with the maple leaf. We should capitalize on this trustworthiness to create an economic brand that will generate global advantages for Canadians and our six key sectors. We know a brand differs from"marketing. "A brand has to be true and authentic. We think that proposals made elsewhere in this report, such as on building a world-class regulatory framework and accelerating technology adoption, are vital underpinnings for this initiative. We also think there is work to be done inside Canada. Despite our strong Canadian tradition of innovation, we also see resistance to change. The Edelman Trust Survey shows that 53% of Canadians feel that the pace of change in business and industry is too fast. A cultural shift to increase confidence by celebrating our own successes will be important to ensure that Canadians can be positive about the future and to build a culture of innovation and innovators. 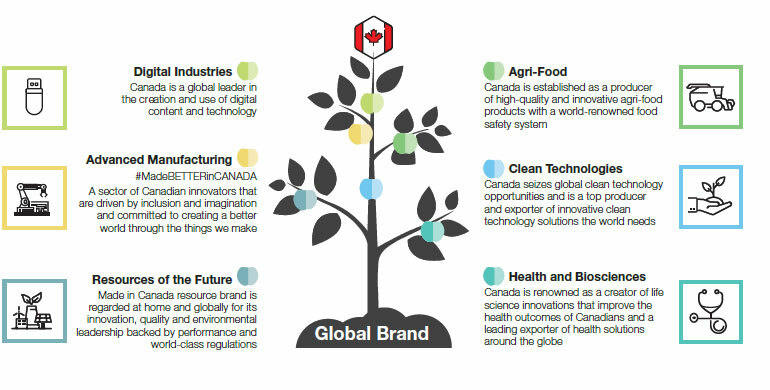 We call for the government to work with industry in our six key sectors to develop a globally recognized Canadian brand. This could build on existing work by Export Development Canada (EDC), which identifies six international perceptions from around the globe that should be leveraged to increase the competitiveness of the Canadian brand. These include land of natural resources and open spaces, being resource rich, having a good reputation, as well as being innovative, trustworthy and multicultural. These perceived areas of strengths must be leveraged in an overarching economic brand, and then applied to recognizable identities in the six key economic sectors. The brand should be developed through a government/ industry partnership—possibly with government"matching funds"that could be unlocked through industry participation—and tested to ensure it resonates with a global audience. Once in place, it is recommended that we anchor the brand with a major international event to leverage global media markets, attract attention, and promote future tourism and investments to ultimately raise the global profile of the brand. A century ago, Sweden was among the poorest nations in Europe. Today, it is a world leader in innovation—this despite being a small country, home to just 0.13% of the global population. The Innovation Union Scoreboard 2017, an index published by the European Commission, ranks Sweden as the leading European Union country for innovation. Reasons for this include a historic tradition of inventors, a commitment to gender equality and a strong belief in the individual. Close collaboration between research institutes and the private and public sectors is another key factor, setting the foundation for global companies such as AstraZeneca, Ericsson, IKEA and Volvo. The Swedish government has chosen to focus strategic investments in three key areas: medicine and biosciences, technology and climate. Innovation is closely linked to research and development, and Sweden is one of Europe's top-three spenders in this area, investing 3.3% of GDP in R&D in 2015 . How did Sweden build its brand? Since the late 1990s, Nordic states have competed to brand themselves as nations and regions in the global reputation market. In 1995, the Swedish government created the Council for the Promotion of Sweden (NSU) to achieve this and to promote a strong, enduring global image. NSU membership includes both private and public sector institutions (including representatives from the country's Ministry of Foreign Affairs, the Swedish Institute, Invest in Sweden Agency, VisitSweden, the Swedish Trade Council, and the Ministry of Enterprise and Innovation). The NSU has released three national branding strategies since 2007. The strategies leverage the country's collective image as a social, moral and economic powerhouse, and set out the conditions for promoting the Swedish brand. Since its inception, the NSU has been successful in increasing global knowledge of Sweden. Through the promotion of consistent messaging, it has created awareness of its industries, people and places, attracting investors and talents as well as tourists and political allies. Canadians are innovators by nature and the world has noticed—so must we. Canadians need to see the value of innovation in their everyday lives. Canada has given the world some of its best inventions, including the telephone, the zipper, peanut butter, the JAVA programming language, the lifejacket and insulin. We recommend a national social marketing campaign to make Canadians proud of our homegrown innovations and raise our aspirations to Own the Podium in the future. This would be based on successful programs such as Heritage Minutes , Bell Let's Talk and ParticipACTION , not only in approach but also in the successful partnership model underpinning them, which blends government, industry and not-for-profit. "As this is a business led initiative, we need to put focus on a road map for each of our emerging technologies, and link them to our priorities in key sectors. We need to communicate our opportunities—to simplify the investment decisions for business, and also to make us an interesting market. We need to say it out loud: this is what health care needs, this is what manufacturing needs, etc. Our biggest enabler is if firms say, 'I want to produce that in Canada'. We have plenty of people who can develop anything, they just need to be told, this is where we are going, this is what is going to have the biggest impact for Canada, please support us with this." "To me, the work starts now. It's about creating a movement that sets Canada up for success. It just jumps off the page, the commonalities between all the Tables. This is what it means to be truly innovative and in a true partnership." The Economic Strategy Tables are just getting started. 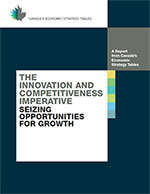 Canada has identified six high-potential sectors, and this report outlines their innovation and competitiveness roadmaps. Moving into Phase II, we need to maintain our momentum. That means engaging our sectors into action, sustaining the Table apparatus, refreshing our membership and connecting with superclusters, all levels of government and educational institutions. Basically, making change happen. Going forward, the Tables can serve as a"board of directors"to advise on implementation and results. We have made specific recommendations on skill hubs, regulatory innovation and competitiveness councils, infrastructure councils, networks to drive industry 4.0, value-based procurements, and branding. These mechanisms can't be implemented in isolation: we call on government and industry for strong coordination and alignment to achieve the greatest possible outcomes for Canada. The six high-potential sectors need to be a long-term commitment. We have outlined why increased economic growth and competitiveness improve the living standard of Canadians. For all of our sakes, this approach must continue. Table members will need support as they work together and as industry works with government and other partners to implement the growth strategies set out here. We need to build interconnectivity between sectors—including the support of timely data. Today, data collection does not translate easily into the six economic sectors. That needs to change, as we can't evaluate our progress and course-correct without knowing where we stand. The growth targets we provide in the following pages are in Canada's national interest. Our recommendations focus on achieving those targets. We call on the Government of Canada to align its policies with them—for example, setting performance goals for trade commissioners that are based on the sectors' growth targets. In the end, execution matters—and that involves all players. Beyond the federal government, the provinces and municipalities play a crucial role in setting regulations, building infrastructure and driving procurement. We ask them to work with us, to build on behalf of all Canadians for a better future and a more competitive Canada. There's no time to waste—so let's do what we must to give the world, and Canadians, more Canada. McKinsey & Company provided fact-based research and analysis to support the development of the Economic Strategy Tables’ signature recommendations presented in this report.